Be equipped with sound teaching. Share your faith with confidence. Learn more through leading Christian apologetics programs. Biola's Christian apologetics programs at Talbot School of Theology are led by some of the most respected thinkers and scholars in the field — individuals who seek to honor God with their minds and engage the world with a rationally grounded, intellectually sound case for faith. Talbot’s Christian apologetics programs seek to train Christ followers to defend the faith, present the gospel and impact the world. Both of Talbot's Christian apologetics degree programs will stretch you as you explore a faith-based perspective on topics such as evolution, the reliability of Scripture and the problem of pain. You'll have the opportunity to wrestle with challenging questions, both in the community of your classes and independently as you reflect on course material. You'll come away with a secure foundation of faith, a compassionate heart and a mind that's been prepared to answer questions with confidence and authenticity. Our top-ranked Christian Apologetics programs — available in online, on-campus and hybrid (online and on-campus combined) formats — are designed to train and equip believers to give the case for the Christian faith. Take a look at our top faculty and the programs listed below to see which one is the best fit for you. Interested in applying to one of our master’s programs? Learn more about our process so you can get started. Get all the information you need about our tuition costs and financial aid opportunities and see details for the departmental Acts 17 Scholarship. 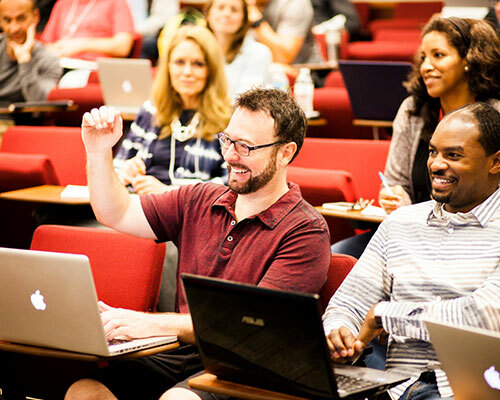 Apologetics programs are available in online, on campus and hybrid formats — including a unique summer residency experience. Enter for a chance to win five of our faculty’s latest books! The winner will receive books by JP Moreland, William Lane Craig, Clay Jones, Craig Hazen and Scott Smith. The offer ends April 30! Want to know what it’s like to be in one of our programs? Watch the video linked below to hear what our current students have to say about their experience at Biola and why they decided to study apologetics. Connect with us to see all that Talbot’s apologetics department has to offer. Find great articles, lectures, student and alumni interviews, information sessions and more.